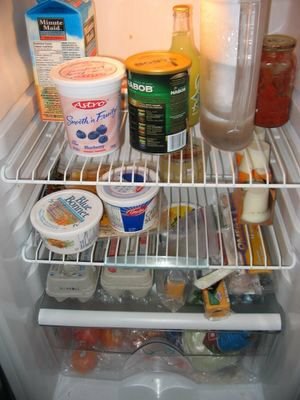 Premature Nostalgia: Can you really judge a person by what's in their fridge? Can you really judge a person by what's in their fridge? The following is an inventory of the contents of the fridge that Brie and I share. I just went grocery shopping, so this is my food for the week. If you have any brilliant meal ideas that contain any of the following ingrediants, please let me know! I hate being a student. You could make a mean blueberry, cheese omelette. With a side of rice pudding tortillas. And wash it down with citrus flavoured coffee. But make sure you use the brita filter for the coffee, that way the drink comes out smooth. I think that just about covers it. Either that or you could just pick up some kd, im sure some student over there has kd kickin around! Wow. That's almost as sad as my fridge. I hate the days where I go grocery shopping, get it home, decide to eat, and realize I don't care to eat anything I bought. ground coffee will not stay fresh if you keep it in the fridge. only if it is still in 'bean' form. The best idea would be to keep it in a relatively air-tight container in regular atmosphere. You can also use it as a paperweight or reading material while waiting for the microwave to complete its cook task. Also: Juice is best served cold, so you've got it in the right place. Thanks for the tip, but the "coffee" thing is up for debate amongst coffee snobs worldwide, like myself. "A coffee snob?" you might be asking yourself confused, "but she's drinking Nabob!" Well, I'm a student. Anyways, the reason people suggest that you don't put ground coffee in the fridge is because it can pick up ordours and flavours from other foods. But since there is nothing else in our fridge, this isn't an issue. As for other factors about keeping your ground coffee out of the fridge...as I said, it's up for debate. P.S. I have worked in a snobby non-chain coffee shop for the last 6 years on and off.